Posted in Fish, Grilling, on October 31st, 2018. A kind of a salmon salad, but hot salmon, cold relish with arugula or greens underneath. Vividly, I recall the first time I ate a peppadew pepper. Oh my golly, was I in love. It was at a restaurant in San Diego, and for a week I was on a mission to find them, and eventually I did. Now they’re in lots of places, even Trader Joe’s. Mostly, now, I buy them at an olive bar in one of my local grocery stores because I don’t use them often enough to keep it stocked in my frig. Peppadews are sweet and piquant at the same time. They have little to no heat in them. They add a lovely surprise in your mouth. And they work perfectly with this salmon dish. First you need to make the Tunisian relish – dried currants (or golden raisins work fine), soaked in hot water to plump them. A cup of green olives chopped (tart type, not ripe), a bunch of the peppadew peppers chopped up, some olive oil and sherry vinegar, salt and pepper, and that’s it. Set that aside to marinate a little bit. The salmon is marinated in some of the relish for half an hour then grilled. On the plate you combine the greens with the reserved marinade (serves as a dressing here) then divide the salmon amongst your serving plates, spoon any leftover marinade on top and sprinkle on the relish. A one dish meal in my book. From a class with Tarla Fallgatter. What’s GOOD: the combination of the relish ingredients is sublime. 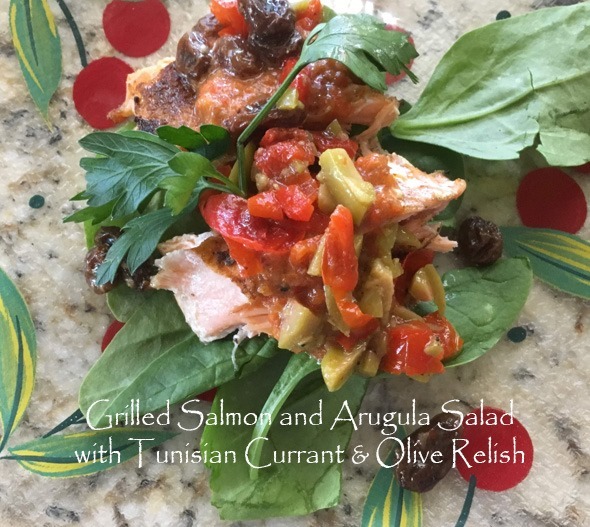 You won’t need a huge serving of this (the salmon, I’m speaking of) because it is served as a salad – so you get some good salad stuff in there too. Loved it. What’s NOT: nothing really – just the time to mix up the relish, I suppose. I think if you made more of it, it would keep for a week or so – to use on something else. For me, the peppadew peppers make this! 1. MARINADE: Soak currants in equal quantity of hot water until plump, drain and transfer to a blender. Add roasted pepper, Peppadew peppers and their liquid and the olive oil. Puree. Season lightly with salt and pepper. 2. RELISH: Prepare and mix the relish ingredients rogether and set aside. 3. SALMON: Toss salmon with half the marinade and let rest 30 minutes. Grill until fork tender. 4. SALAD: Toss the arugula or greens with some of the marinade and divide among plates. Divde salmon into individual serving pieces and place on top of the arugula. Spoon some of the reserved marinade over the salmon, then sprinkle with the Tunisian Relish. Per Serving: 451 Calories; 32g Fat (62.7% calories from fat); 17g Protein; 26g Carbohydrate; 4g Dietary Fiber; 39mg Cholesterol; 295mg Sodium. Posted in Chicken, Grilling, on October 10th, 2018. 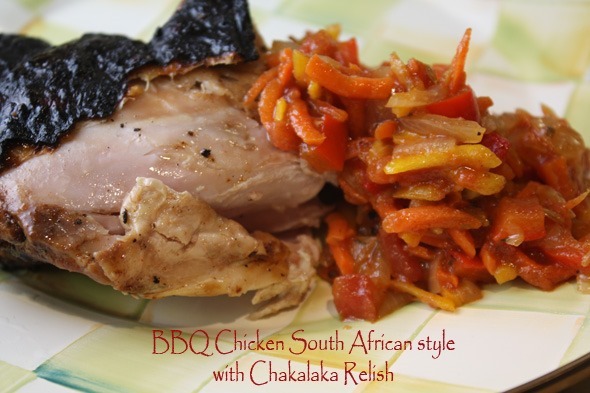 Just another grilled chicken recipe, but with a South African twist. The picture at right is Sarah Graham. A cookbook author, writer, and a host of two seasons of a cooking show on the Cooking Channel. 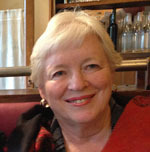 She lives in South Africa, and what I loved about her show was the location – she filmed outside and off in the distance behind her outdoor kitchen, were wild animals. You might still be able to find her shows on reruns if you look up Sarah Graham’s Food Safari. When I was watching her show, it was just before and just after I went to Africa and did a couple of weeks of safaris (loved it). I do enjoy listening to South Africans with their very different English accents. So it was with Sarah Graham. A few recipes from her shows got saved to my to-try file (recipes are still available at the Cooking Channel, I would assume), and this is one of them. This post is lagging a bit behind – – I made this over Labor Day weekend when I decided I was not going to be sitting home on the holiday Monday doing nothing. So I invited a group of friends over (all widows) and we did a potluck dinner. One friend brought lovely Dutch cheeses and crackers. Another brought a delicious apple crumble pie; yet another a green salad, another a rice, green chile and cheese casserole, and lastly a cold broccoli salad. And I did the main dish (chicken) on the grill. Along with a very unusual relish (that mound of red stuff on the right on the plate at top). Here’s a photo of our group, from left: Annette, Judy, me, Judy and Mary Lou. Nancy took the photo. It was a gorgeous evening – we had been having lovely weather the last 2 weeks, gearing up, probably for blistering heat we usually have in September and October. I made strawberry gins – I should write up a post about that. 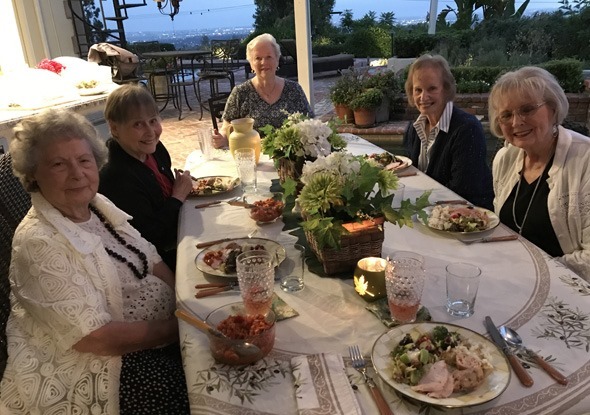 My family (well, the ladies of my family) enjoyed them mostly in England, but we also found them in Paris and Florence also. So very refreshing. I found strawberry gin at my local “Total Wine,” but you might have to seek it out. You macerate a strawberry or two in a glass, add the strawberry gin, then top off with tonic. And lots of ice. Then wedge a strawberry on the rim of the glass, add a mint leaf and present! So, back to the chicken. I’m going to post the relish tomorrow – so DO wait until you get that recipe before you make this. The relish is so unusual and different, but goes perfectly with the chicken. Anyway, the recipe indicates using a spatchcocked chicken (my Trader Joe’s has them fresh) or you can ask a butcher to cut it, or you can cut it yourself. You cut through the backbone (and remove it completely) and flatten out the bird so it can lay flat on the grill. You might have to nip a bit around the breast bone to get it to flatten out. I decided, actually, to cut the bird in half as I thought it would be easier for me to maneuver on the grill. It was a 5 pound bird I bought. Marinate the chicken overnight – I used a big Ziploc bag – first I added in all the marinade ingredients – oil, balsamic, pourable honey, lemon juice, paprika, dry cilantro, cinnamon, garlic, fresh red chile, and a little jot of ketchup. The next morning I turned the bag over and squished the marinade around (it doesn’t make all that much). About 45 minutes before grilling, take it out of the refrigerator and let it warm a little bit. Meanwhile, fire up the grill. You might find this hard to believe, but truly I’m a novice or an apprentice (but without a teacher) at the grill. You read this here before, my DH Dave was the grill meister in our house, and I merely told him what I needed him to do – cook to what temp and what the internal temp needed to be. He loved everything about mastering the grill techniques. Me, not so much. Because I’m alone now, when I have to manage or monitor what’s on the grill, I have to leave my guests – although every one of my friends understood why I was up and down checking on the chicken. No way did I want it to overcook! What’s GOOD: really liked the flavor, and it was super-moist and tender. I first grilled it over high heat, then turned it down to medium and kept checking the internal temp. The skin charred well (see photo at top) but the chicken just below it was juicy. The relish that went with it was a hit – it’s very unusual. The marinade did give the chicken some flavor, and cooking it with the lid down on the grill gave it some smoky flavor too. Likely you could bake this in the oven easily enough too. Yes, I’d make it again. What’s NOT: nothing other than needing to start this the day before, to marinate the chicken. 1. In a sealing plastic bag, mix together the ketchup, olive oil, balsamic, honey, lemon juice, paprika, dried cilantro, cinnamon, garlic, chiles and a generous pinch of salt and pepper. 2. Add the chicken, squish it around, seal the bag and refrigerate at least 1 hour, or preferably overnight. Turn bag over at least once so the other side of the chicken is marinated as well. 3. Remove the chicken from the refrigerator 20-30 minutes before cooking to bring to room temperature. 4. Grill the chicken, lid down, for 30 to 35 minutes, or until cooked through, turning halfway and basting with extra sauce every 10 minutes. Thigh meat should register 160-165°F. 5. Serve immediately with a side salad and the chakalaka relish on the side. If you have fresh cilantro, sprinkle a little bit on top of the chicken. Cut serving sized pieces and plate it. Per Serving: 680 Calories; 48g Fat (63.8% calories from fat); 51g Protein; 10g Carbohydrate; 1g Dietary Fiber; 247mg Cholesterol; 283mg Sodium. Posted in Beef, Grilling, on September 4th, 2018. Have you joined the fans clamoring for skirt steak? It’s relatively inexpensive, as steak goes, but it does require careful grilling and it needs to be sliced thin as it’s a more-chewy cut of meat. My favorite steak is ribeye. That’s no secret if you’ve been reading my blog for any length of time. I haven’t had a steak for awhile – once in a blue moon I do make one for myself – and it’s very satisfying, I must admit. When my DH was alive, we’d have a steak every 2-4 weeks, for sure. Dave love-loved them. And he had perfected the cooking of them on the outdoor grill. My poor barbecue doesn’t get much of a workout with just me these days. We’ve had a really hot and muggy summer here in SoCal. Hotter earlier than usual, and more muggy than usual. So I don’t tend to go outdoors in the early evening as it’s just too uncomfortable. 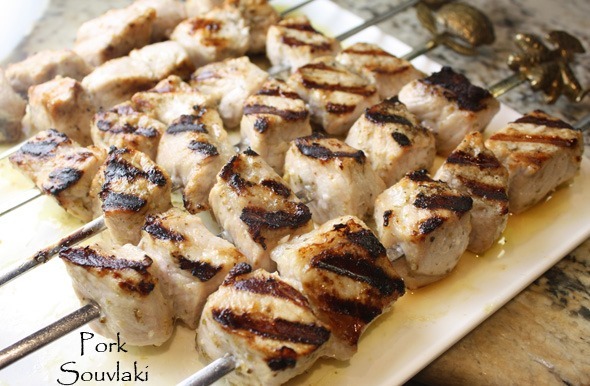 So this recipe would fit perfectly into that routine since it can be done on an indoor grill. This skirt steak (also called flap meat in some grocery stores – it’s a boneless portion of the diaphragm muscle attached to the 6th through 12th ribs on the underside of the short plate) does need to be marinated for at least 8 hours, or overnight if you can make the time to do it. That helps tenderize the rather chewy cut of meat. And in case you’ve never done a skirt steak, when you buy it, it’s a big, long piece of meat, relatively thin and very grainy when you look at it. Do cut it up into manageable pieces before marinating and then grilling them. This marinade is heavy in the oil component. It needs it here, although when you’re done, that marinade gets thrown out anyway. Combine the ingredients in a plastic Ziploc bag, and turn the meat a few times to coat everything well. Then seal it up and stick it in the frig until later. 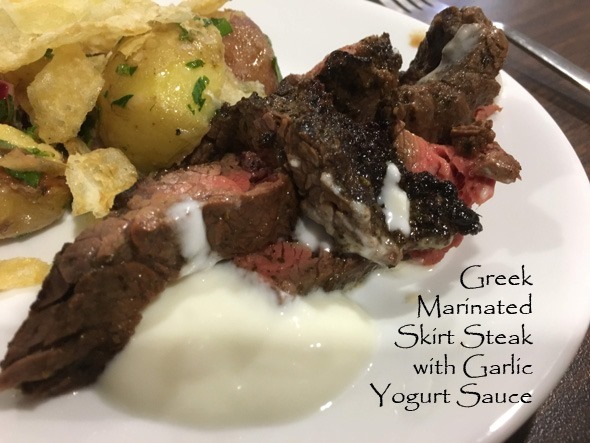 Make the garlic yogurt sauce – it’s easy to do – Phillis Carey (this came from a class with her) prefers regular yogurt, not Greek, but I think I’d use Greek. She said you could, it’s just that the sauce will be much thicker. Do make it several hours ahead too, so the garlic and lemon juice will mix and flavor all the yogurt. Chill it until you’re ready to serve it – can be made the day before if you want. Use your indoor grill pan and place a piece of heavy-duty foil on top. Oil it and grill as usual. Easy cleanup. Now, the grilling. I was so impressed – Phillis discovered that you can save all the cleanup of an indoor grill by covering the top with foil – you just lay the foil on top – don’t press it in/on it. Spray or brush the foil with some of the oil from the marinade – try to get just the oil, not the lemon juice part. Or, barring that, just spray with olive oil spray. Pick up the meat pieces with tongs and just let them drain for 5-10 seconds (over the open bag) then place on the pre-heated grill. You’ll be so surprised – the meat gets grill marks just as if it’s right on the pan itself. This meat, however, only wants to be grilled for 3-5 minutes per side. The meat shrinks up something fierce – you might think that 2-3 pounds of skirt steak would feed 10 people, but NO, it shrinks a lot. In case you don’t know, skirt steak is quite fatty – you can’t SEE the fat very much – but enter the meat into any nutrition info and you’ll find that it’s very fatty. Sad to say . . . but it’s full of flavor. More flavor than regular steaks, it’s true. Let the meat sit, tented with foil, for about 5 minutes once you’ve taken it off the grill then use tongs and a sharp knife and cut it across the grain into thin slices. Pile it onto a heated platter and serve with some of the garlic yogurt sauce drizzled over it, and serve the remaining in a bowl to pass at the table. Or, as I suggested a few days ago, serve this steak with the BLT Salad with Grilled Corn and Buttermilk Parm Dressing. What’s GOOD: the flavor, first of all. Easy to do, easy marinade, easy grilling – just watch it carefully and don’t overcook it – served medium-rare at most (cooking it further may make the meat more tough). What’s NOT: really nothing except watching the grilling carefully. 1. STEAK: Combine olive oil, lemon juice, garlic, mustard, herbs, salt and pepper in a large Ziploc bag. Mix well, then add the skirt steak(s), turning to coat well. Refrigerate at least 8 hours or overnight. 2. SAUCE: mash the garlic with the salt into a paste. Stir the garlic into the yogurt along with lemon juice.Cover and refrigerate up to one day ahead. 3. Preheat grill. If using an indoor grill, place a piece of heavy-duty almuminum foil on top of the grill and oil it. Remove steak from refrigerator about 45 minutes before cooking time. Using tongs, remove steak from marinade and let it drain for 10-15 seconds (over the bag), then place on grill for 3-5 minutes per side for medium rare (depends on the thickness of the meat), then let meat rest on a cutting board, tented with foil, for 5 minutes before slicing thinly on the diagonal (across the grain). Mound meat on a heated platter, drizzle with some of the yogurt sauce, sprinkle with parsley and serve remaining sauce on the table. Per Serving (assumes you’re consuming all the marinade, which you don’t): 694 Calories; 57g Fat (74.6% calories from fat); 39g Protein; 5g Carbohydrate; 1g Dietary Fiber; 102mg Cholesterol; 727mg Sodium. Posted in Fish, Grilling, Salads, on June 14th, 2018. Healthy, easy, refreshing for a summer evening. A post from daughter Sara . . .
As I’ve started watching my diet a bit, I find myself looking for flavorful, yet easy dinner dishes. This is a true match for the easy and healthy. 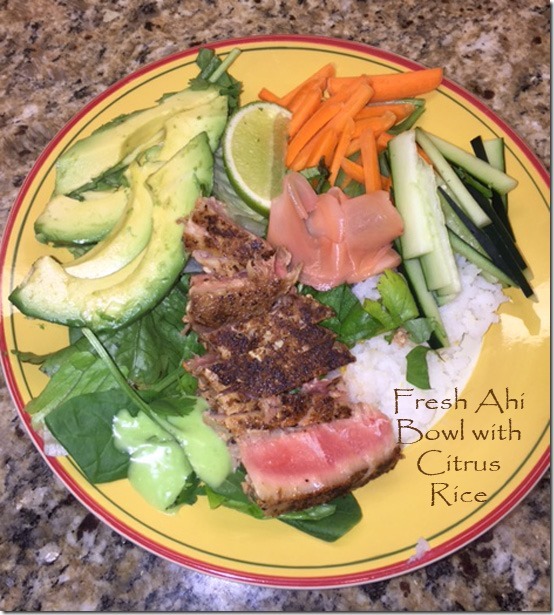 I had my first Ahi Bowl at a restaurant called The Fish District in San Diego, CA (near where I live). The crisp veggies with warm rice and fish make this a wonderful summer dish. I love the combination of sweet teriyaki with the nose-burning touch of wasabi sauce. I cook the Ahi outside on the side burner of my grill (well actually, my husband does – I’m banned from the grill as I apparently don’t clean it correctly!) This is my own at home version. With blackened seasoning to go on the fish, and julienned veggies to fix, I can bring this dinner together in about 20-25 minutes. With a bottle of teriyaki sauce to drizzle and a squirt of wasabi sauce (don’t use the pure wasabi) it’s so easy to just make a big platter with everything on it (rice on the side) and everyone can take what they want from the platter. For me, it’s no rice, but my family loves the lemony rice to go along side. Everyone loves it! And by the way, I buy my Ahi at Wal-Mart. I’ve found it to be really fresh. I buy it in a big pack and stick it in the freezer, then defrost what I need (one small steak per person, usually). What’s GOOD: my family particularly loves lemon rice (which I make to serve with other things too), and they like ahi. We all do, and we can pick what we want to eat on the “bowl” with, or without rice. I use spinach only instead of rice. Easy dinner and healthy too. What’s NOT: nothing really – maybe only the time it takes to julienne the carrots and cucumber. Otherwise, it’s such a cinchy-easy dinner to prepare. Be sure to not overcook the ahi – you want it bright red in the middle. 1. Using outdoor grill, rub grill lightly with oil (use tongs and a saturated, folded square of paper towel), then place ahi over high heat until grill marks appear. Turn ahi over and repeat. Do not cook for more than about 45 seconds on each side – you want grill marks on the outside but the ahi to be rare/raw in the middle. Remove to a cutting board and cut across the grain into this slices. Quickly serve while it’s still hot. 2. If preferred, use a very large platter and place salad ingredients in decorative piles, with ahi in the middle. Serve rice on the side. For each serving, place rice and/or salad on bottom of bowl. Arrange each veggie separately around edge of bowl. Place just-off-the-grill sliced Ahi in center. Sprinkle cilantro on top. Drizzle with terriaki and wasabi sauce. Per Serving: 438 Calories; 9g Fat (26.3% calories from fat); 7g Protein; 50g Carbohydrate; 4g Dietary Fiber; 53mg Cholesterol; 115mg Sodium. Posted in Beef, Grilling, on June 4th, 2018. Is it hard to see what’s in that photo? Grilled sweet onions on the left, a nice pile of thinly sliced, grilled flank steak, then a creamy horseradish sauce with onion. I can’t say that flank steak is one of my favorites. Although you can make it tender with a marinade (this one wasn’t marinated for tenderness, just spice rubbed for flavor), it’s tricky to do just the right amount of tenderizing without the meat becoming mushy. If you’ve ever had mushy meat, you’ll know what I’m talking about. 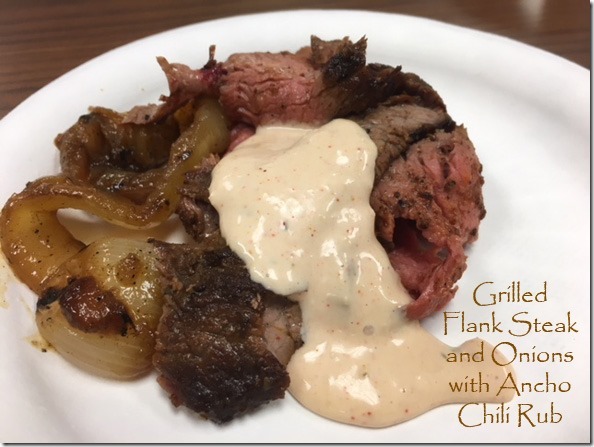 This steak was served at a great cooking class with Phillis Carey, and although I love-loved the flavor of this combination, I think I’d do the same rendition but with ribeyes instead of flank. Or maybe with a nice piece of sirloin, sliced thin. By far, the onions were my favorite part (sweet onions grilled with a spice rub on them too) and I lapped up the horseradish spiked mayo sauce with every bite of meat. This sauce, what Phillis called an Onion Blossom Horseradish Sauce (she was mimicking the jarred Orange Blossom Horseradish Sauce, is it made by Rothschild?) and it’s really good, and very easy. It needs a few hours to combine the flavors – do NOT just make the sauce as you’re preparing the meat – it needs at least an hour to meld. It wouldn’t hurt the meat to be spice rubbed at the same time then kept chilled until ready to grill. You used to not be able to find ancho chili powder in stores, but you can these days, so do seek it out. The rub comes together very easily with standard ingredients in most spice cabinets. The rub is used on both the steak and the onions, with you having tossed the onions with some olive oil first so the rub will stick to it. You’ll use most of the rub on the steak and the remainder on the onions. The flank steak is rubbed all over with oil just before grilling for 7-9 minutes per side (no more than that or it will be overcooked). Once grilled, transfer the steak to a cutting board and tent it with foil for 8-10 minutes, then slice thinly on the diagonal and pile it onto a heated platter along side the onions and then drape the sauce over the top. Delicious! What’s GOOD: the flavors are marvelous. I particularly loved the onions, but then I love grilled onions. Just remember to buy the sweet ones and slice them thickly. Do slice the flank steak thinly across the grain and pile them onto a serving plate (looks pretty that way). What’s NOT: the meat will be a bit chewy – some folks like steak that way (me not so much). Otherwise, this is a stellar recipe – you’ll need only a green salad to complete the meal. 1. For the sauce, combine all ingredients in a small bowl. Cover and refrigerate at least 1 hour and up to 4 days. 2. Preheat the grill. In a small bowl combine the ancho chili, cumin, coriander, mustard, oregano, salt, pepper and cayenne in a small bowl to make the rub. Pat dry the flank steak with paper towels and coat well with most of the rub. Sprinkle onions with some of the rub as well; brush or toss onions with a bit of oil. 3. Brush the flank steak with oil all over and place on the grill. Cook the steak 7 to 9 minutes per side or to desired doneness; cook the onions next to the steak. Transfer the steak to a carving board and let rest, tented with foil, for 8 to 10 minutes. Slice the steak across the grain into 1/4-inch-thick slices. Serve steak with onions and drizzled with sauce. Per Serving: 447 Calories; 36g Fat (70.7% calories from fat); 24g Protein; 10g Carbohydrate; 3g Dietary Fiber; 67mg Cholesterol; 1277mg Sodium. Posted in Beef, Grilling, on September 10th, 2017. Plenty of flavor here, and you just won’t believe how easy the cheese sauce is. 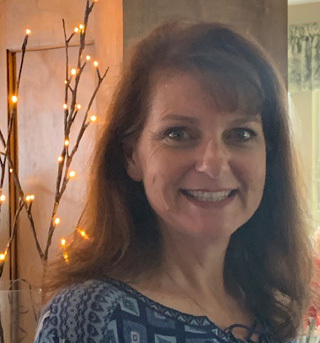 At a recent cooking class, the instructor, Susan, said she prefers top sirloin steak to any other kind. So I had to stop and think . . . when I first met my DH, he wouldn’t even try anything else except top sirloin. I thought it was too chewy and sometimes tough. Eventually, I lured him to ribeye (my favorite) and he never went back. When we’d have Sunday night family dinners (mandatory for the teenage kids to be home) we often had a big one that Dave did on the grill. 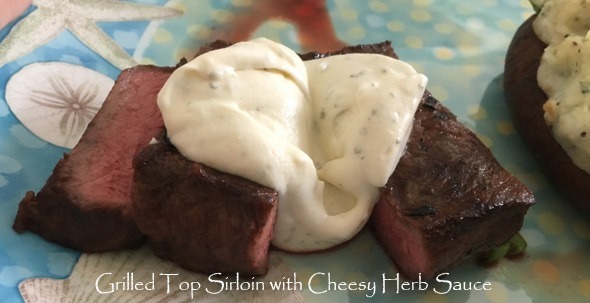 His favorite way was with Bearnaise sauce on the side, but for me, that sauce was a lot of work to make, and sometimes it failed, so I gave up on that. But oh, THIS sauce. You won’t believe it!! It’s nothing but a container (or two) of Boursin or Rondele cheese, very gently heated until its melted. That’s IT! But, there’s one other unusual item in this steak preparation – it’s marinated with oil, balsamic vinegar and a little bit of FIG PRESERVES. Interesting, huh? The marinade doesn’t penetrate the meat very much, but it does leave a little residual of the fig on the outside, and that gets nicely caramelized when it’s grilled. Altogether delicious. This steak is so cinchy easy, you won’t believe it. The key to the meat is cutting it into thin slices – I’d probably slice it even thinner than shown above – that way if there are any tougher bits, they’re manageable. Or, you could certainly make this with a ribeye, New York, filet mignon, or even flank steak. I’d put a tenderizer on the flank, but the others don’t need it. Once the steak is off the grill and resting for a few minutes, heat the cheese and pour onto the individual servings. Or, you could serve it on the side. The sauce is not overwhelming at all – you might think it would be, but no. Altogether delicious. What’s GOOD: how easy this meal is to make – marinating for a couple of hours, draining, grilling, then melting the cheese. How much easier could it be? 1. Process vinegar, oil, salt, pepper and fig preserves in a blender until smooth. Place in a ziploc plastic bag. Add steak and squish it well so all the steak is covered. Refrigerate for 2 hours (more isn’t needed). 2. Remove steaks from marinade, drain on paper towels, and discard marinade. 3. Preheat grill to medium-high and grill steak for 5-7 minutes per side, until it reaches about 125°F, for medium rare. Remove steak and allow to rest about 5-7 minutes, loosely covered in foil. 4. Place cheese in a small saucepan and VERY gently heat it until it’s hot. 5. With a sharp knife, cut steak across the grain in about 1/4″ thick slices. Nap the slices on serving plates and drizzle each with some of the cheese sauce. Per Serving: 670 Calories; 54g Fat (71.1% calories from fat); 37g Protein; 12g Carbohydrate; 0g Dietary Fiber; 152mg Cholesterol; 414mg Sodium. Posted in Fish, Grilling, on July 4th, 2017. Trust me on this one – it’s a winner. Years ago, it must have been in the late 80s, my DH and I took a cruise on the inland passage to Alaska. That was our first one (we did it 3 times). We were with a group of friends. The ship left out of Vancouver, for a week, and we just loved it all. Since I get seasick, this trip was one of the few I could do as there was only one 12-14 hour stretch when these routes are in open ocean (and all 3 times we did this trip, I was down sick in the stateroom for the duration of open-ocean cruising feeling very quesy). At one of the ports of call on the Alaska mainland, we took a day trip up into a deep lush valley and enjoyed a salmon lunch cooked over open coals, huddled under some plastic tarps to protect us from the rain. It wasn’t anything fancy – the salmon, some cole slaw, as I recall, and potatoes, or a potato salad. But what I remember was the salmon. OMGosh was it good. I asked the chef, who was gently tending the salmon, worrying that the rain was going to damp out the coals, what was in the glaze he was brushing on the huge slabs of salmon. He said, butter, brown sugar and white wine – and I think he said equal quantities of each. Pretty easy. I tucked that bit of info into the back of my brain and never pursued trying to find a recipe for it. Then I was reading something some years back, and the memories of that salmon came flooding back into my brain. We didn’t go to Taku Lodge back then (it’s a 15-minute flight in a small plane from Juneau), but it brought back all those wonderful mouth-watering memories of our first salmon bake in the wilderness. This link has the recipe, and also this one from Sunset Magazine’s version from 2003. It’s taken me this long to make it. What a waste of years – not to have made this until now. Sunset’s recipe is the one I used. Both recipes are a little bit different – same ingredients, but different quantities. One has you marinate the salmon (I didn’t), and I didn’t grill it on the open grill – I did the salmon slab on heavy-duty foil, in a kind of a foil-sling/pan with the edges of the foil rolled inward so the glaze wouldn’t drip out. I had my son-in-law man the gas grill, putting the “pan” on the heat for about 4 minutes, then moving it off-heat until it was fully cooked – maybe 10 minutes. You know it’s done when the collagen starts leaking up through the flakes. We moved the foil slab onto a serving platter and guests just cut what they wanted with a long spatula. You can scoot the salmon off the foil pan onto a heated serving platter – looks prettier that way. As it turned out, even with 8 people eating, we didn’t quite finish 2 slabs, and I was so happy about that because I crumbled half of it into a green salad for lunch one day and the remainder I ate as dinner a few nights later briefly reheated in the microwave. There was a little bit of the glaze in the refrigerator container I had it in, and I almost wanted to drink it (I didn’t). What’s GOOD: the glaze gives the salmon a lovely sweet caramely kind of taste. It’s not overly sweet, but I suppose you could cut down on the sugar if you are concerned about that. The butter keeps it moist. It’s just wonderful. Do try it. What’s not: nothing that I can think of – this is a quick, easy dinner. Do use two layers of the foil so there aren’t any chances of a leaking accident in the grill. That would not be good! NOTE: I buy the whole farm-raised salmon slabs at Costco and they vary in size and thickness. 1. In a medium saucepan melt butter over medium heat. Stir in brown sugar until dissolved. Add lemon juice and wine. Stir and heat through, about 5 minutes. 2. Prepare foil “pan,” by placing 2 pieces of heavy-duty foil together, spray foil with nonstick spray, then place salmon on top, curling the thin, tapered end under so the salmon slab is about an even thickness. Carefully crinkle/roll the foil edges inward so it kind of surrounds the fish, like a boat. 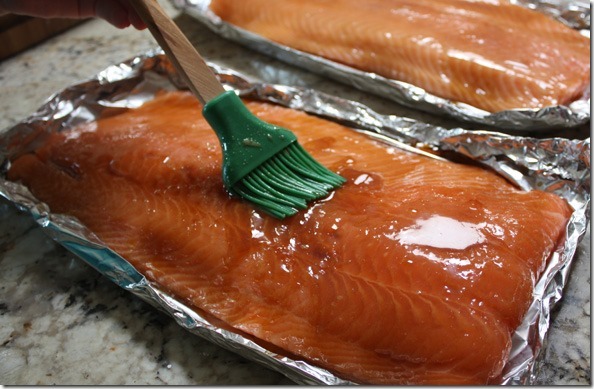 Baste the salmon with the glaze (don’t use it all). Set aside until the grill is ready. 3. Preheat grill to high. Leave one part of the grill off, or bank coals to one side. 4. Turn down the grill heat to medium. Place salmon “pan” on heat for about 4 minutes, then move the “pan” to the unheated side and continue cooking (lid closed). Baste the salmon several times with the glaze. It’s done when the collagen begins to leak through to the top of the salmon, about 4-8 minutes, depending on the thickness. 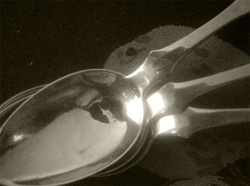 The fish should flake when tested with a fork. 5. If desired, open the short end of the foil pan and using a spatula, gently scoot the whole salmon off onto a heated platter. Pour any remaining glaze over the top. Garnish with minced parsley. Per Serving: 226 Calories; 11g Fat (44.1% calories from fat); 19g Protein; 12g Carbohydrate; trace Dietary Fiber; 70mg Cholesterol; 147mg Sodium. Posted in Fish, Grilling, on May 25th, 2017. Oh my, the most luscious garlicky buttered shrimp ever. Having watched another America’s Test Kitchen or maybe it was Cook’s Country show on TV, and seeing them make this, I vowed I was going to make it forthwith! These are SO good. So full of garlic butter, so flavorful. 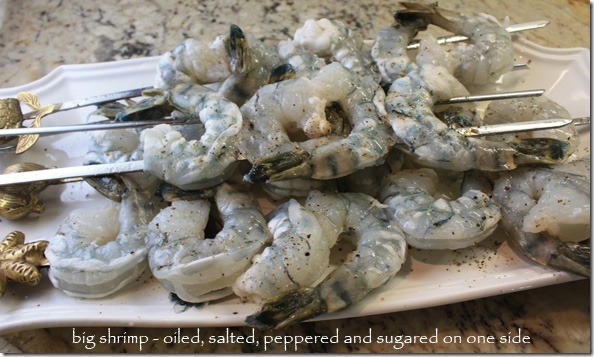 Doing shrimp on a grill is a bit of an iffy situation anyway – to get all the shrimp done at the same time. If any are smaller they get over done. Larger, they’re not cooked through. So I was glad to use these giant shrimp, all uniform size to make this. 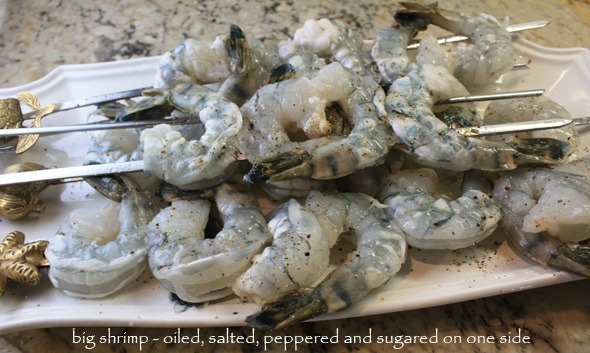 First off, you need a medium sized aluminum pan – big enough to hold all the shrimp you’re going to grill. Into that pan goes the to-be-made garlic butter (butter, lemon juice, copious finely chopped garlic, a few red chili flakes and salt). I got that done ahead of time and set aside. Then, the shrimp is skewered (using double skewers assures they won’t flip over or around during turning) and they’re oiled, salted and peppered. AND on one side only, you sprinkle just a tad of sugar. Standing in front of your preheated grill, you put the aluminum pan over the heat. While you stand there (do not leave your station!) stir it as the butter melts and begins to bubble. 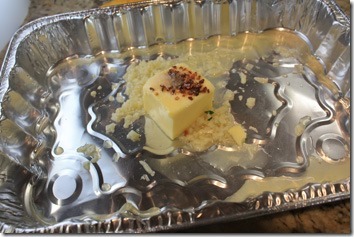 The butter should NOT brown – just bubble and melt completely, with the garlic in it. Once that’s done, the aluminum pan is scooted over to a non-heated area of the grill – to a place where it stays warm, but doesn’t cook. Then, the shrimp is placed sugar-side-down on the hot grill. It cooks for only a few minutes, maybe 4-5, depending on the size. You want the shrimp to reach a finished temp of 120°. Turn the shrimp skewers over and cook for another 1-2 minutes until they’re just cooked through, and at that magic number of 120°. I used my trusty instant-read thermometer (Thermapen). When the shrimp is cooked, using a big fork, slide the shrimp off the skewers and into the pan of garlic butter. 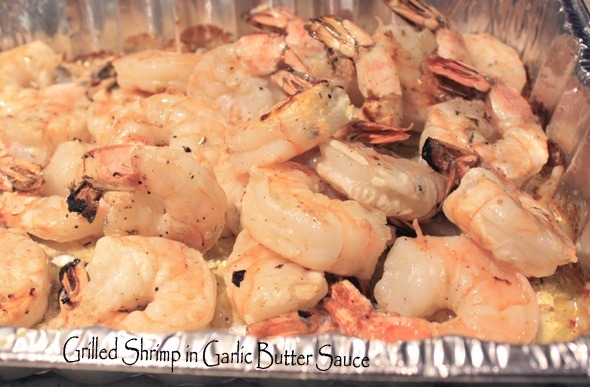 Have a spoon at the ready and toss and turn the shrimp so all the sides get coated with the garlic butter while they’re piping hot. Let it cook, sizzle a little and get soaked in that garlic butter. Whisk the pan to the kitchen, sprinkle with some chopped parsley and serve them IMMEDIATELY. To raves. I promise. What’s GOOD: well, the shrimp I used were really big, which makes (for me anyway) a much more enjoyable shrimp-eating occasion. I don’t like little shrimp – I like them to have some real chewiness and heft. So, do try to buy big ones when you make this – you’ll be rewarded with ooohs and aaaahs. The garlic butter was perfect – garlicky enough, smoothed with melted butter and just slightly heated with chili flakes. This was a very EASY entrée to make. Truly it was. My darling Dave would have been manning the grill, but I managed. The first time I made this my friend Bud (Cherrie’s husband) cooked them; the 2nd time I made them and it’s really simple to do. Do all the prep work ahead and you’ll be rewarded with an easy dish to serve. Truly delicious with garlic butter. Do notice the low calorie count on this one, too. What’s NOT: can’t think of any thing that wasn’t wonderful. 1. Pat shrimp dry with paper towels. Thread shrimp onto skewers, alternating direction of heads and tails so that they are closely pushed together. Brush each side with oil and season with salt and pepper. Sprinkle one side of the shrimp with sugar. 3. Place skewers with shrimp on hot side, sugared side down, and be sure the shrimp are closely pushed together. Cook for 4-5 minutes and then flip, cooking other side 1-2 minutes. Using an oven mitt, pick up each skewer and using tongs, slide the shrimp off the skewer and into the pan containing the sauce. Toss and cook until fully cooked, about 30 seconds. 4. Remove from grill, add parsley,toss and serve. DO drizzle any remaining sauce over the shrimp. 5. SAUCE: Put butter, juice, red pepper and garlic in the pan and place on the hot side of the grill, cooking until butter is melted and bubbly. Move to cooler side. When shrimp are grilled, place in the hot sauce and continue to cook for about 30 seconds. Remove the pan from grill, add parsley, toss, remove from sauce and serve. Per Serving: 253 Calories; 14g Fat (50.1% calories from fat); 28g Protein; 3g Carbohydrate; trace Dietary Fiber; 293mg Cholesterol; 371mg Sodium. Posted in Chicken, Grilling, on March 23rd, 2017. What’s another marinated and grilled chicken recipe? Oh, but this one is really, really good. It contains some different spices (Indian) and a bit of kick, and it makes a nice presentation. What I wanted for this dinner was Indian food, but not a curry or gravy, or a sauce – I wanted Indian spices. So I made the pepper and onion roast with soft Indian spices you read about a few days ago, and I made this grilled chicken. I can’t recall where I read about this guy (I think it’s a man – Bademiya – I misspelled his name in the text on my photos – apologies) who has a food stall near one of the upscale hotels in Bombay (Mumbai). He’s been there for years, and his grilled chicken is legion-famous. His, made there at his street stall is fiery hot, so hot most Westerners can’t eat it. Steve Raichlen, though, had it and went home and recreated it, taming down the hot spices. (I tamed it down too.) It’s from his cookbook: The Barbecue! Bible . Raichlen is a wizard behind the grill. He loves to travel the world, discovering new and different ways cultures adapt meat to a grill. The marinade is easy-peasy with toasted and ground spices (coriander, cumin, peppercorns), garlic, ginger, oil, lemon juice, cayenne, salt and cilantro. The chicken legs (thigh and drumstick – the broiler leg) marinate for 4-6 hours, then they’re grilled until just done (about 20-25 minutes depending on how big/thick the thighs are) and you serve it with some onion slices, a lime or lemon wedge to drizzle over, and more cilantro. Done. The ONLY thing I’d do differently, making it again, would be to soak the onion slices for 10-15 minutes in acidulated water, to tame down the bite. I don’t much like raw onion and in fact I didn’t eat it when I made this, but it looks nice. I don’t think anyone ate it. I served this with a mango chutney, but it’s probably not necessary – I just thought it would be a nice addition. What’s GOOD: loved the flavors in this from the coriander seeds, peppercorns and cumin seeds, garlic and ginger. They make a great combo. Chicken was very flavorful and cooked just right. Yes, I’d make this again. What’s NOT: nothing, other than you do need to make time to marinate the chicken. 2. Heat a dry skillet over medium heat and add the coriander seeds, peppercorns, and cumin seeds. Toast the spices until fragrant, 2 to 3 minutes, shaking the skillet occasionally. Let cool, then transfer to a spice mill and grind to a fine powder. Combine the ground spices in a blender or mini chopper with the garlic, ginger, oil, 1/4 cup water, lemon juice, cayenne, and salt. Process to a smooth paste, adding more water if necessary to obtain a pourable consistency. Add the cilantro and process just to mix. 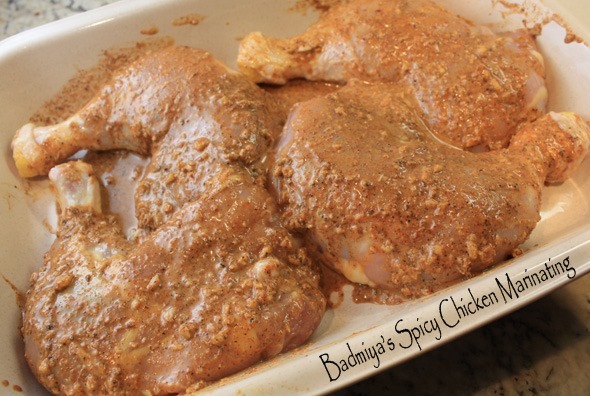 Using your fingers, spread the seasoning paste over the chicken legs to coat on both sides, then cover and let marinate, in the refrigerator, for 4 to 6 hours. 3. Preheat the grill to high. When ready to cook, oil the grill grate. Remove the chicken legs from the baking dish and arrange on the hot grate. Grill, turning with tongs, until the juices run clear when the tip of the skewer or sharp knife is inserted in the thickest part of a thigh, 6 to 10 minutes per side (12 to 20 minutes in all). ONION: Meanwhile, if desired, add the onion slices to a small dish of acidulated water (cold water and a tetch of vinegar). Let sit for about 10 minutes, drain and pour onto a paper towel. This step softens the bite of raw onion. This isn’t in the original recipe. 4. 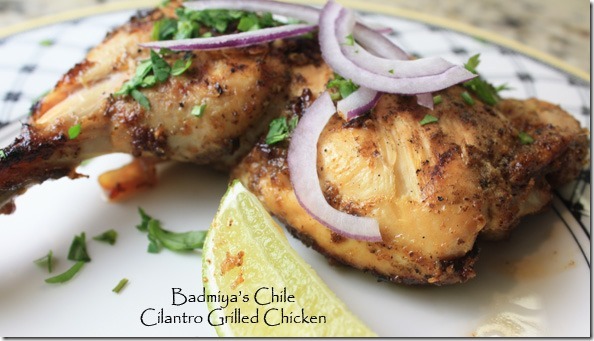 Transfer the chicken legs to serving plates or a platter and serve immediately garnished with sliced red onion, cilantro and lime or lemon wedges. Per Serving (this assumes you’ve eaten the skin): 432 Calories; 31g Fat (64.8% calories from fat); 31g Protein; 7g Carbohydrate; 1g Dietary Fiber; 139mg Cholesterol; 937mg Sodium.